Last updated: October 2, 2018 by Rootwell Products Inc.
Hostas are beautiful shade-loving plants that grow big, lush leaves, and long shoots with purple flowers in late summer. They come in an almost endless variety of colors and shapes – green, blue, silver, variegated, and more. You can get hostas that will stay small and hostas that will make your garden look like a tropical paradise at the height of summer. 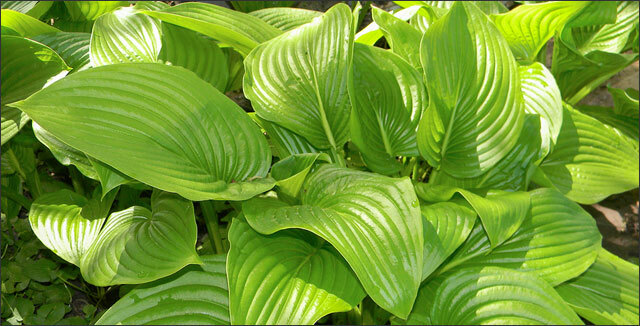 Hostas need relatively little upkeep, and they do well in a variety of locations, although they prefer dappled shade. They take about eight years to reach full maturity. However, when they do mature, they can quickly fill up space in your garden. In addition, they will need maintenance every 3-4 years after that. They can also start to die off in the middle – only sending up shoots around the perimeter. This condition means the hosta is too big and does need to be divided. Not only are hostas hardy where you plant them, but they can also tolerate being divided. Eventually, they need to be distributed and propagated in new areas, or they will grow too big and stop receiving the nutrients they need to thrive. Or you may want to divide up your hostas to give some to a friend! What is the right time to divide those lush beauties? Are hostas too vulnerable in the spring when they’re expending their energy to send up shoots to soak up the crisp sunshine? Or, are they most needy when they are supporting their most significant growth at the end of the season? Hostas can be divided at almost any time of year. They may take some extra work to become established in their new homes if you transplant them at the height of summer. The hostas will need additional water during the summer months. However, if you’re dividing hostas or moving them to a more shady and ideal location, it might do the plant more good than damage to protect them from the scorching sun! There are two more ideal times to divide up your hostas – early spring and late summer. Early spring can be useful for both plants and gardeners because your hostas are starting to send up shoots and can quickly establish themselves in a new place with the proper care – just in time to fully bloom for the summer season. 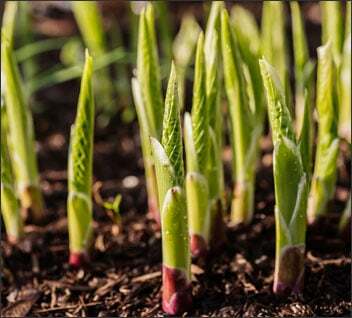 The optimal time to propagate hostas is generally in September for more northern climates. For southern climates, October is the more ideal for hostas to be divided. 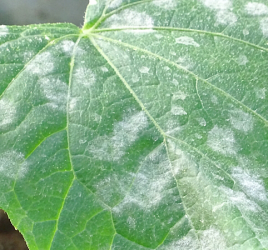 Yes, you will have some bigger leaves to deal with, but this can also be an advantage. If you know the size of the plant you will be dealing with next season, you will have a better idea now of where it will fit best. You have a four-week window to divide your hosta plants in the spring. You want to get to them once the “eyes” are beginning to pop out of the ground but before the leaves begin to unfurl. The eyes of hosta are the points at which a shoot of leaves forms and grows upward. These will be your guide in choosing where to divide your big plant into smaller ones. In any division of any plant, you are going to lose some of the root system. It can’t be helped. When you choose to divide, you are setting your plant back some years in maturity. However, you can decide how far back this will be based on how small your divisions are. If you are planning to divide your hosta into two big clumps, you will lose less maturity. If you want 30 small eyes to set in various places or to give away, be aware that you’re starting with baby plants at that point. You can also divide off several single “eyes” to give friends without disturbing the main clump. These are all things to keep in mind as you proceed. Fall divisions give you a four-week window as well. What you need to do is look at the first frost date on a long-range calendar like the Farmer’s Almanac. Plan to divide your hostas no later than one month before that first frost date to avoid killing your plant by putting a vulnerable new transplant into a ground that’s about to freeze. Your hosta should do well with the added precipitation of fall, but it still needs some warm weather to recover. 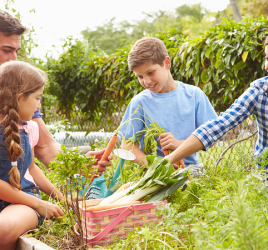 You will need the right tools: garden spade, garden fork or both and a dull knife for smaller divisions. For larger divisions, you need a shovel with a sharp edge. Hostas can sometimes be broken apart, but you may end up cutting them. Before you divide, make sure the soil around your hosta is damp from rainfall or from being watered the previous day. 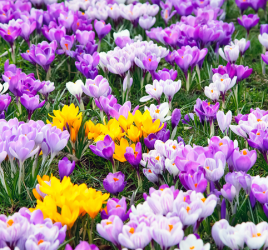 Dig your spade in around the clump and lift it from the ground. Some gardeners like to do this with a fork. 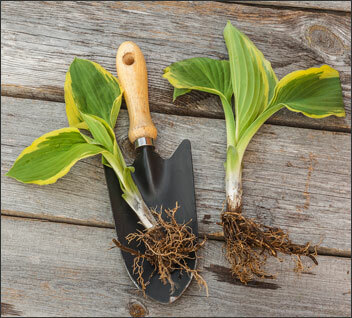 The depth you’ll have to dig will vary, depending on the type of hosta you’re dividing. Some are easy to get to at 8 inches deep, and others are going to be much deeper – closer to 18 inches. You are going to be prying the whole clump out of the hole and dividing from there. You may want to use a tarp or a piece of plywood as a firm surface to do your cutting. What you want to avoid is taking off an eye with no roots attached. Cutting in halves or thirds gives your plant the best chance of survival, as does relocation, if necessary, to a shadier spot. Some gardeners like to use the sharp spade to make one clean cut. Others gently shake all dirt away and pull the clump apart. This method may take some patience. Use this opportunity to add compost and needed nutrients back into the soil before you replace or relocate your plants. Dig a slightly bigger hole, and fill with organic fertilizer. If you’re hoping for a fuller look to your original hosta plant, break the main clump into several chunks and place them close together. By the time they grow back again, you won’t be able to notice it’s not one big plant. Hostas are not drought-tolerant. To make sure your newly propagated hostas are receiving adequate water, nutrients, and air to the root zone, install Root Starter Sticks. Propagating hostas is a wonderful and low-maintenance way to get color and variety into your garden. Use the division of your hosta plants as a way to propagate them all over your yard for free, or give a little “eye” to a friend as a way of saying you care. Your hosta plants will come up year after year with very little work on your part.